General. 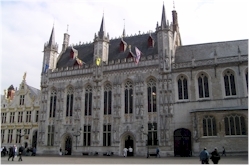 The town hall of Bruges is one of the oldest in the Low Countries and stood example for several town halls that were erected in other towns afterwards. The building was completed in 1421 but enlarged and adapted to the needs in the centuries that followed. The facade is richely decorated with gothic windows, towers, statues and the coat of arms of subordinate towns. Inside you should not miss the impressively decorated gothic room. There is also a museum on the ground floor. Brief history. At first the town council assembled in the belfry tower where they had their meeting room. Due to a fire in 1280 however, they had to find another location. They moved to the "ghyselhuys" (a former prison) that served as town hall for a bit less than a century. At the end of the 14th century, the ghyselhuys was demolished to make place for a new town hall. The building was ready in 1421. The present town hall largely dates back to 1421, although there were some alterations during its life (enlargements, adaptations to new needs, decorative changes,...). The eye-catchers of the building are the facade and the so-called gothic room. The facade is adorned with a large number of statues depicting biblical figures and rules of Flanders. These statues are not the original ones; those were destroyed in 1792 during the French occupation at the end of the 18th century. Once the occupation was over, new statues were carved but due to an inferior quality of the materials, they soon had to be replaced. It eventually took till the 80's of the last century before all statues were renewed. The facade also shows the coat of arms of subordinate towns. Those coat of arms were also removed during the French occupation and replaced afterwards. The "gothic room" is actually not gothic but neo-gothic. After a fire turned the interior largely to rubble, it had to be refurbished. That project started in 1890 and was finished in 1905. 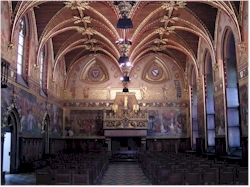 The result is stunning with a massive decorative mantelpiece, a double polychrome pending wooden ceiling, wall paintings depicting historic events from the history of Bruges and large number of other decorative elements.